It's the last Friday of the year folks! Can you believe it? It's so crazy to think that a whole year has gone by so fast, almost as if in the blink of an eye. So much has happened this year, both good and bad, but thankfully mostly good. I'm beyond thankful that my family and friends have all been in good health throughout the year, and that nothing seriously bad has happened in my life. I know that, unfortunately, the same can't be said for many around the world, such as the shooting in Orlando, the terrorist attacks in France, the current situation in Aleppo, and for some, our country's new presidential choice. Although so much has happened this year, one can only hope that many good things are coming our way in 2017. Let's all hope for good health, happiness, love, and fulfillment of dreams. I, for one, have a mental vision board of everything that I'm hoping for. I would love to have a healthy year, as well as for my parents and my fiancé. I need to help my Dad lose some serious weight before it really starts to affect his health for the worse. I need to also keep on planning my small 2018 wedding and hope for the best. I would like to keep on growing in my relationship with my fiancé, having a strong one full of love and understanding and moral support and development. 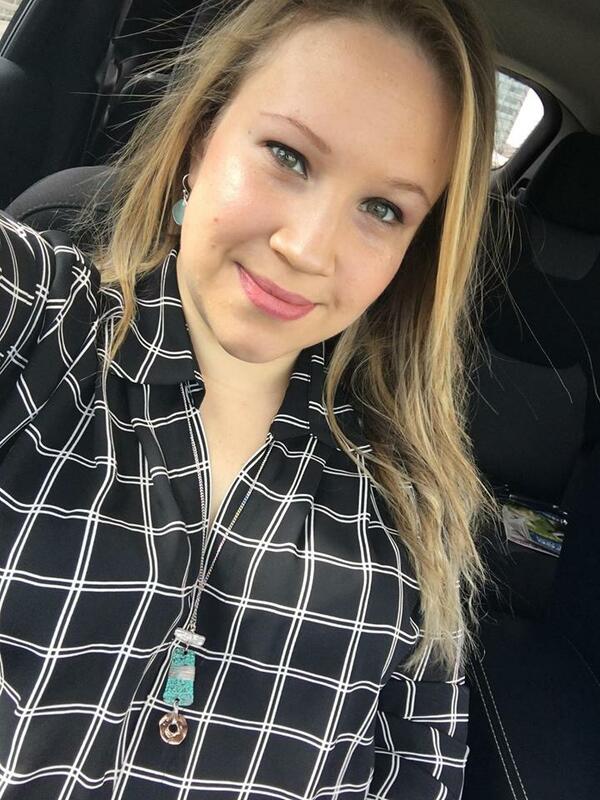 I am also hoping to start the search for our next place, which would be the first house we own - we've been renting apartments for some time now. I would love to help my Mom with her dream of starting her own business in the food world, whether it's manufacturing and selling her homemade jams and preserves or maybe starting a small bakery of some sort. Just, there's so much to look forward to next year and I'm not the only one in my family with all these goals. Christmas Day at my parents' house was definitely full of thoughts and aspirations; we even went around the dinner table saying our goals and wishes, promising to help each other out in achieving them. 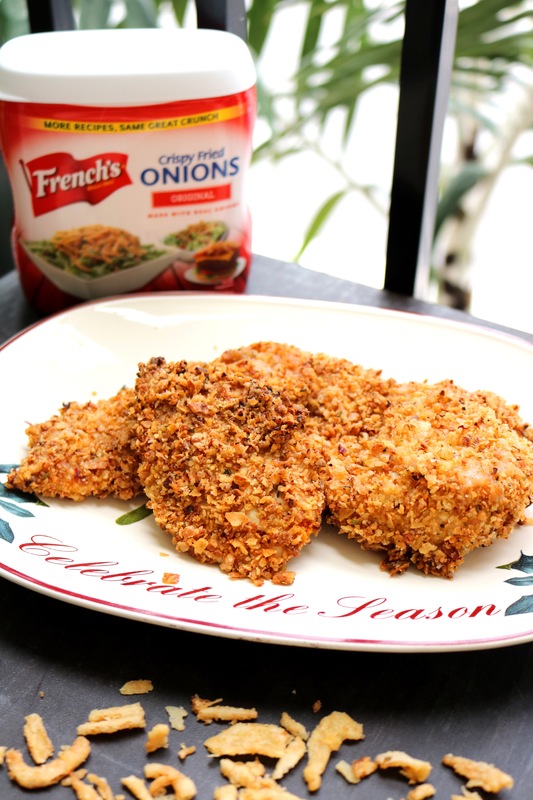 During this dinner, one of the things we all enjoyed eating was this Crunchy Onion Chicken, which features French's Original Crispy Fried Onions. I received the Crispy Fried Onions for free courtesy of Influenster's Tasty VoxBox around Thanksgiving (and all opinions are my own). For many years now, I've grown used to seeing the box of Crispy Fried Onions at my parents' house since my Mom has always used it when making her Green Bean Casserole, but I had never personally used it in my cooking adventures - until now. I browsed the French's website looking for a non-traditional recipe that would fit well in my family's Christmas Day dinner, and this recipe stood out. It had a small list of ingredients and a minimal cooking time - a perfect combination for cooking on Christmas Day. At the 10 minute cooking mark, my whole apartment smelled divine, and I knew that the chicken was going to come out amazing. And it did! The 20 minutes it took to cook the chicken was just enough time to cook it thoroughly while leaving it plenty juicy and tender. The flavor also really stood out. The onions, somehow, didn't taste like straight up normal onion, and instead took on a whole new dimension of flavor. It's hard to describe but it had that umpf factor, a bold flavor but rich at the same time, which took a normal chicken breast to a different level. My family loved it, and is even having me make it again for New Year's! I wonder... maybe I should try using the Caramelized Onions next time, or even the White Cheddar Onions :) I'll keep you posted. 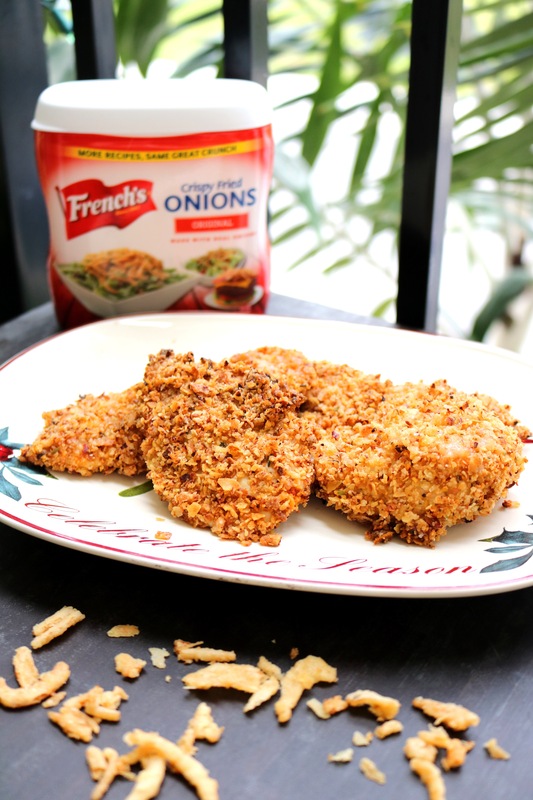 "Crispy fried onions add flavor and crunch to your chicken for an easy week night meal the whole family will love!" 1) Place onions and flour into plastic bag. Lightly crush with rolling pin. Transfer to pie plate. 2) Dip chicken into egg; then coat with onion crumbs, pressing firmly to adhere. 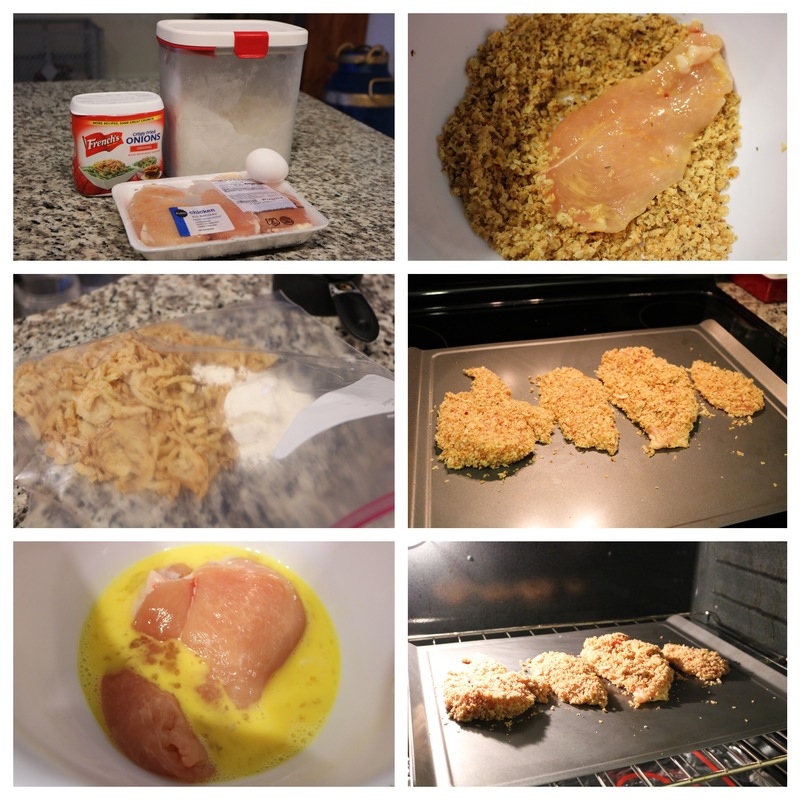 Place chicken on baking sheet. 3) Bake at 350F for 20 minutes or until no longer pink in center.